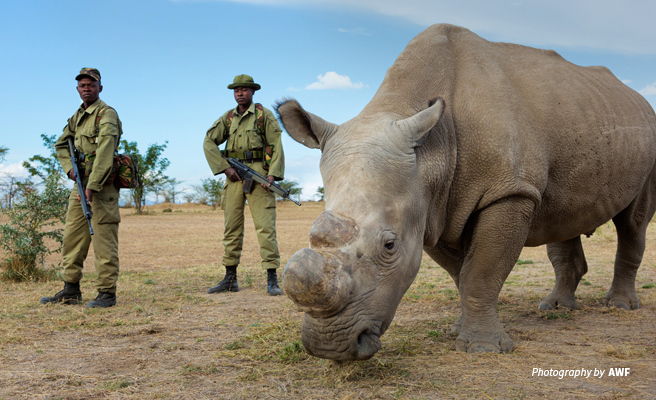 By the time he passed away on March 19, 2018, Sudan had spent a decade under 24-hour armed surveillance at the Ol Pejeta Conservancy in Kenya. He was 45 years old — long past his breeding age and suffering painful degenerative changes in his muscles and bones in his final months. The team of expert veterinary doctors monitoring Sudan’s condition took a difficult decision to euthanize him, leaving behind the last of his subspecies: two female northern white rhinos. 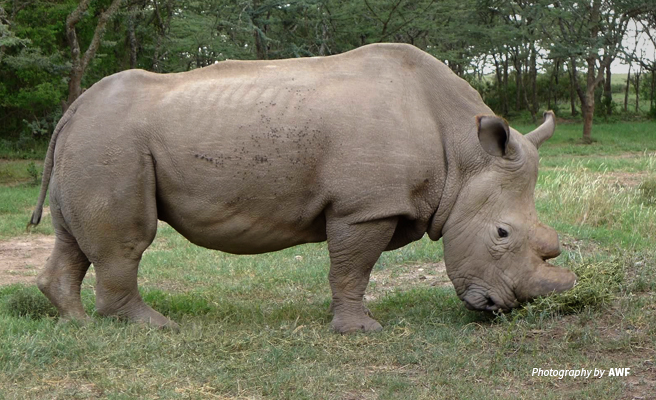 Before Sudan moved to the 700-acre enclosure at Ol Pejeta Conservancy, he spent many years at the Dvůr Králové Zoo in the Czech Republic with seven other northern white rhinos, but they struggled to produce any offspring. In 2009, Sudan and another male named Suni, and two females — who were in fact Sudan’s daughter Najin and granddaughter Fatu — were relocated to Kenya. With climate conditions and natural vegetation closer to the northern white rhino’s native habitat, the semi-wild setting at the conservancy in Nanyuki was intended to improve their chances of breeding. Sadly, Suni died in 2014 and veterinary doctors later discovered that both Najin and Fatu were unable to reproduce naturally. Since Sudan’s death in 2018, the possibility of in vitro fertilization has renewed hopes for the white rhino subspecies but the highly-specialized process is delicate and projected to cost millions of dollars. The northern white rhino was originally found in Chad, the Democratic Republic of the Congo, Uganda, the Central African Republic and South Sudan. But rampant poaching, driven by political violence and insecurity in the region decimated populations in just a few years. The last known protected northern white rhino breeding population was built up in the 1990s, from a small group of 13 survivors in the Garamba National Park in the Democratic Republic of the Congo to a peak figure of 32 individuals, but all were subsequently lost to poachers and armed groups. However concerted conservation efforts to protect its southern counterpart at the height of the poaching crisis saved the white rhino species from the brink of extinction. From an isolated population in South Africa of not more than 50, the southern white rhino has recovered to 20,000 ranging across the region. A few were introduced to Ol Pejeta Conservancy, which is also home to the largest and most significant black rhino sanctuary in East Africa. Since 2014, AWF has supported the mixed-use wildlife conservancy to safeguard rhinos against poaching — still the biggest threat to the species’ survival. We have helped Ol Pejeta’s rhino team improve its monitoring and management capacity — including enhancing the accuracy of black rhino monitoring via ear notching. The ability to accurately identify all rhino reduces the opportunity for fraud based on misreported sightings. Ear-notching individual rhinos also helps wildlife protection authorities detect losses over time, improving accountability at the species management level. By the end of 2016, the Ol Pejeta team successfully ear-notched 26 black rhinos — eight more than the original target. Previous AWF support allowed the conservancy to purchase motorcycles and radio charging systems, which increased staff’s field mobility and the ability to stay in touch to aid in monitoring. AWF helped construct new, modern housing blocks for 12 rhino protection rangers. These new housing blocks were placed at strategic locations on the rhino range, where care was taken to minimize degradation of the wildlife habitat during construction. The housing incorporates sustainable design, including water harvesting and solar power generation. Ultimately, these improvements contribute to enhanced morale for Ol Pejeta’s rhino rangers who are the front-line defense against poachers. In 2018, both white and black rhinos at the conservancy achieved a population growth rate of 6 percent. Zero rhinos were poached in the same year, further underscoring Ol Pejeta’s potential for species conservation. The continued survival of its rhino is paramount, as this population acts as a critical buffer against poaching losses in other areas. To accommodate the conservancy’s expanding black rhino population, there are plans to secure an adjacent dispersal area, creating a contiguous corridor in the wider wildlife ecosystem of Laikipia. 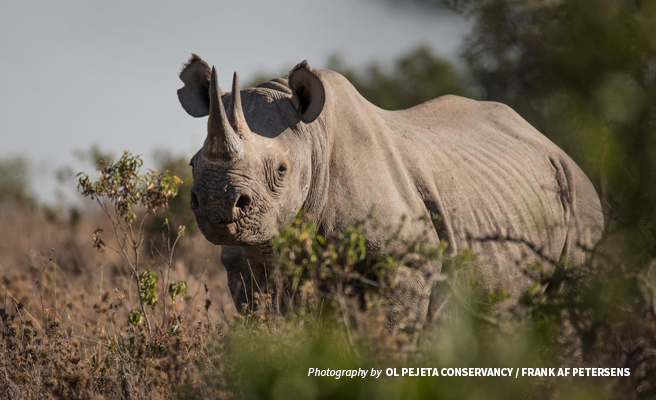 Similarly, AWF’s long-time support of the Kenya Wildlife Service-operated Ngulia Rhino Sanctuary is securing a stronghold and breeding ground for Kenya’s black rhinos in the Tsavo landscape. We have increased the monitoring capacity of wildlife rangers and bolstered the boundaries of the fenced sanctuary, which was expanded in 2007 to protect just over 90 sq. kilometers of wildlife habitat for rhinos and other important species. Government action over the past few years has offered Africa’s rhinos a measure of protection against poaching. AWF supports wildlife prosecutors and judicial officers to develop strong legal frameworks that streamline wildlife crime investigation and prosecution across the continent. Our wildlife crime training also extends to community wildlife scouts and protected area rangers, equipping these professionals with the requisite defense in instances of poaching, illegal wildlife trade, and also human-wildlife conflict. However, poaching will not stop until demand for wildlife products like rhino horn, ivory, and pangolin scales drops. At the IUCN African Rhino Specialist Group Meeting held in February 2019, researchers presented evidence that trade is still prevalent in China, including Hong Kong, where the trophies are openly sold. In fact, there is a growing illegal rhino horn trade through Laos and Myanmar to meet demand in region, where it is used as a traditional cure for a range of ailments despite no scientific proof of efficacy. Apart from our awareness-building campaigns educating consumers in China and Vietnam about the horrors of rhino poaching, AWF is committed to safeguarding remaining populations on the ground. We are currently supporting a ground survey in the Lakes State of South Sudan headed by the Ministry of Wildlife and Tourism to establish if any northern white rhinos survive in the area. To eradicate the rhino horn trade and illegal wildlife trade, we must focus on ending the demand while closing markets to avoid any more species facing the same tragic fate as the northern white rhino. Nathan Gichohi is Manager, Species Protection at African Wildlife Foundation. As a conservation biologist, he works on more than 40 species protection projects, focusing mainly on rhinos, elephants, and large carnivores, in AWF’s priority landscapes. Nathan is also Project Manager of the Biosphere Reserves as Model Regions for Anti-poaching in Africa (BRAPA) and collaborates with multiple stakeholders to understand the dynamics of poaching across critical biodiversity hotspots in sub-Saharan Africa.